Booking our honeymoon through Hellenic Holidays was one of the best decisions we made throughout our wedding process! We spent 2 nights in Athens, 4 nights in Mykonos and 4 nights in Santorini and the trip was unforgettable. Petros listened to and worked great within our budget and trip priorities and the entire trip was so smooth! Everything with our travel was planned and coordinated, down to rides to and from the airport and shuttles to our day excursions. The hotels selected for us were beautiful and in convenient locations and all of the recommendations for day activities were great. We still cannot get over all of the incredible food and wine recommendations Petros provided! Petros made it so we did not have to worry about a single logistic for the honeymoon. Overall, it was an incredible and memorable trip! We cannot recommend Petros and his services through Hellenic Holidays enough! My husband and I just returned from our honeymoon last week and it was truly an unbelievable trip. We did a total of 9 nights in Athens, Mykonos and Santorini. Petros listens to what is important to you and caters the itinerary to match. Each hotel he recommended was better than the last and we loved each one in each city. Every time we stepped off a plane or ferry there was someone waiting for us and it was so nice not to have to worry about a thing. We had such an amazing time, we didn’t want to come home. The food and wine were incredible and we are still craving each meal we ate throughout the trip. Petros recommendations were all delicious and we were so grateful for his assistance at each location. His itinerary was so detailed and let us know exactly how much to tip along the way – something we were very unsure about. Overall I would definitely recommend using Hellenic Holidays if you are considering traveling to Greece. It can be very overwhelming when trying to book on your own and Petros makes it extremely easy and definitely a trip to remember! There are not enough stars to express how grateful we are for Hellenic Holidays. We worked with Petros. With planning a wedding and the honeymoon it could have got hectic. Petros made it so easy and problem free. Everything from the pre planning, to conversations over email/phone, and the convenience of having him take care of the kinks of it all. It was greatly knowledgeable and provided us with a great itinerary that fit our likes. Our honeymoon was more than we could have imagined and I am recommending my family and friends to Hellenic Holidays. HIGHLY RECOMMEND! Petros is an absolute master of his craft. He’s very passionate about his work and it shows. Every hotel and transportation was paid for beforehand and it took all the worry out of everything. Most people we dealt with knew Petros personally and they took care of us like we were family, from bottles of champagne to personalized notes in our rooms. We wouldn’t have gotten the full experience of Greece if we tried to plan this trip on our own as opposed to going through Hellenic Holidays. We used Hellenic Holidays (Petros) as the travel agent for our honeymoon and couldn’t be happier. We decided years ago that we wanted to do Greece for the honeymoon but never really looked into details, islands, etc. After a quick google search we found Petros. From the first conversation, we knew we were going to be in good hands. He walked us through all of our options for different Islands, hotels, the good/bad, what to do and what not to do. We ended up choosing Athens, Mykonos, Naxos, and Santorini. Petros did an incredible job of planning our honeymoon from start to finish. Hotels, private transportation, private tours, travel between islands, meals, excursions, etc. Everything was planned perfectly. It was a dream honeymoon and we would recommend Hellenic Holidays to anyone who wants to go to Greece. Overall, I can’t say enough good things about Petros. He gave us the Greece trip of a lifetime and we will definitely use him for next time we go back! “PETROS FOR THE WIN!” we kept finding ourselves saying this throughout our 10-day honeymoon in Athens, Naxos and Santorini. Not only was every hotel and restaurant recommendation on point, but he completely took the legwork out of the trip. This is SO NICE after planning a wedding for more than a year. He literally thought through every single thing. For example, one of the drivers give us our ferry tickets so we wouldn’t have to waste time getting them. He checked us into our flights (within Greece) and purchased additional luggage allowances. Also ensured our transfers were on time, with plenty of time to spare. Throughout the entire process he was patient (we had him redo our itinerary 3 times because we couldn’t decide where we wanted to go/for how long) and never complained. Just prior to the trip, he gave us a final itinerary with thorough explanations of things to do, sights to see, who to hire, where to go, etc. This thing was our bible, and it left just enough planned and just enough free time to go with the flow and get into our own rhythm for the trip. He also made himself available via cell phone/what’s app, but we didn’t need to contact him because everything was going so well. Did I mention we had two “surprise” hotel upgrades while we were there? It was absolutely the best vacation of our lives… the perfect way to begin our new life together… due in large part to the fact that we used Hellenic Holidays for our trip. Petros and Hellenic Holidays were great to work with, and definitely worth it to make sure we had a great time on our honeymoon! 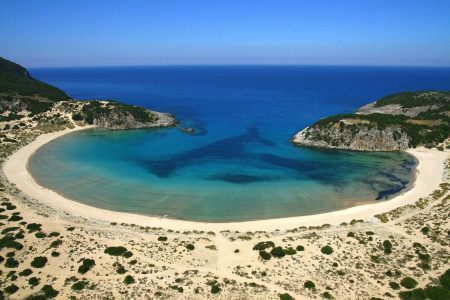 I found Hellenic Holidays online, and was immediately inclined to contact them after the many great reviews I read. Petros takes a lot of time and effort into ensuring that the trip is planned to exactly what you expect. He also goes the extra mile and makes sure even when you are there that everything goes according to plan as spelled out in the final itinerary. I unfortunately lost my phone on my first day of our honeymoon in Athens, and the transport company that Petros uses for the transfers ensured me that they would be right back to bring my phone to me. To me this just shows the quality of people he uses to conduct business as well as the respect that everyone has for him. He definitely helped create a memory that will last a lifetime, and was the perfect way for me and my wife to start our lives together! Just got back from island hoping in Greece! We had an amazing trip – it exceeded our exceptions! We could have never done it without Petros and Hellenic Holidays! Everything he arranged was perfect…. the location and choice of hotels, restaurants, transfers, and private tours! Petros’ advice and detail planning made the trip stress free and relaxing! It was obvious that he had a personal relationship with the hotels because they went out of their way to make us feel special. I think they even gave us their best rooms since each one had an amazing view off our balcony! We cannot thank Hellenic Holidays enough for helping us celebrate our 25th year anniversary with a trip of a life time! I would highly recommend Hellenic Holidays to anyone who is planning a trip to Greece. Save yourself time and energy and let Petros help you create the perfect vacation!! I promise you won’t be disappointed!! My husband and I spent our honeymoon in Greece in July 2018. We found out about Hellenic Holidays through a friend who used Petros to book her honeymoon. Petros was so easy to work with. His recommendations for hotels, restaurants, and things to do were exactly what we were looking for. He really takes the time to personalize your itinerary to reflect your interests and preferences. Petros takes care of every detail, including transfers to take you to the airport, hotel, and ferry terminal. The trip also included a private tour of the Acropolis and a catamaran sailing trip in Santorini which was absolutely beautiful and included a delicious lunch. After spending years planning our wedding, it was so nice to know that Petros was there to take care of everything and plan our entire honeymoon for us. A few weeks before your trip he sends a very detailed itinerary which is around 30 pages long and includes everything you need to know, including a packing list and travel tips. I would highly recommend Petros and Hellenic Holidays to anyone who is traveling to Greece and wants a truly authentic experience. We recently returned from a wonderful vacation arranged by Petros Zissimos from Hellenic Holidays. It was perfect from start to finish. When I started planning our trip to Greece I was considering an escorted tour by one of the larger companies. However, in my research I came across an article recommending Hellenic Holidays. I called and spoke with Petros who was courteous and spoke enthusiastically about Greece. He asked questions about what was most important to us and immediately understood what we were trying to achieve. He made several suggestions and arranged a vacation that covered the cultural, historical, and culinary aspects of the region that we were looking for (Athens, Crete, and Santorini). All of his suggestions were perfect; the hotels, restaurants, and activities. And through his connections he was able to upgrade our accommodations at our hotels and was able to arrange for most of our tours to be private. The personal touches that he provided made all the difference. Although we might have been able to book most of the vacation ourselves, we would not have had the class of service that Petros was able to provide. I would recommend Petros and Hellenic Holidays without reservation and hope that we have the opportunity to vacation again using Hellenic Holidays. I just wanted to say thank you for an incredible trip. Your planning made for an enjoyable, convenience and stress free vacation. We appreciate all the recommendations and had an amazing vacation! P. S. We met quite a few of your other clients and they were having a great time too!! I can’t begin to describe how awesome our trip to Athens-Santorini -Mykonos was. Petros was fabulous. The hotels were off the charts perfect. All connections to each destination was spot on without a hitch. Petros is not only a pleasure to work with but he truly cares about giving you the best vacation experience in Greece and he far exceeds any expectation. I will recommend him to anyone going to Greece. In addition all of our excursions were first class. We could not have had a better vacation and it is due to the planning from Petros. Truly our favorite vacation ever!!!! I just wanted to thank you for organizing a wonderful trip to Greece for my family and I. Everything was seamless and perfect. The hotels were beautiful, the staff everywhere were helpful and friendly and our Athens tour and sailing excursion were top notch. It was so nice to have everything so well organized and not have to think about the next step. It made for a true vacation! We are missing Greece already! Thanks again for everything. Just wow! Using Petros for our honeymoon might have been the best thing we did. From the beginning he was completely helpful, personable, diligent, and knowledgeable. He knows the Greek islands so well and put together a trip for us with countless recommendations of restaurants, activities, etc that were spot on. All the hotels we stayed at (in Athens, Mykonos, Naxos, and Santorini) were outstanding with amazing service, location, and views. We have already passed his contact information along to friends and would highly recommend him for anyone looking to go on an unforgettable trip to Greece. Absolutely incredible Greece vacation! Petros planned an amazing dream vacation for us (Athens-Mykonos-Santorini). We did almost every recommendation on Petros’ itinerary and were not once disappointed. With each day we were more impressed than the last. With travel to each island planned, luxurious hotels booked, and a detailed itinerary full of excellent recommendations each day, our vacation was the exact stress-free vacation we needed! Hellenic Holidays arranged a wonderful vacation for my family. Petros took the time to understand the experience we wanted and delivered it. We visited Athens, Milos and Santorini. From a logistics perspective everything went smoothly. The hotel choices were excellent. The properties were beautiful, the rooms comfortable and the staff attentive and caring. I still cannot decide if I liked the Melian Boutique or the Astra Suites better, both were amazing. We dined at Strofi, Enalion, and Medusa. Great recommendations, all were excellent. The Blue Shades of Greece Tour was a good recommendation. The guide was great and we covered a lot of ground. Going through Petros at Hellenic Holidays was the best decision we ever made. With all the wedding planning we just wanted to be able to not worry about the honeymoon but still wanted to make sure the honeymoon was special. Wow did Petros and Hellenic deliver. We literally didn’t need to do anything and we had the best honeymoon ever. On the trip everything was taken care of for us. Airport check-ins, transfers from the airport/ferry terminal to your hotel and preferential check in check out times all taken care of. Hellenic even went above and beyond and had bottles of wine, champagne and other special honeymoon touches arranged beforehand like rose petals scattered around the bed at all our hotels. Lastly, all the hotels and locations were incredible. Petros picked beautiful hotels in locations that exactly fit our needs and the people at the hotels knew Petros and Hellenic and gave us upgraded rooms because we booked through him. If you want to have the perfect honeymoon in Greece with all those special touches and that you want on your honeymoon, look no further. PERFECT! After deciding that we wanted to honeymoon in Greece, I found Hellenic Holidays while reading the KNOT magazine. Knowing that i wanted this experience to be unforgettable, while also knowing nothing about Greece, I was eager to put the planning of the trip in someone else’s hands. I was so lucky to have found Petros at Hellenic Holidays! He was able to customize our trip to everything we wanted it to be. The itinerary we received was extensive and specific and also included every piece of information we would need for our trip. I am so happy that we used all of his recommendations because my husband and I ate some of the best food we have ever had and experienced things we will never forget! Every hotel we stayed at was unbelievable and all the traveling getting from place to place was seamless. Thanks to Petros, we were really able to enjoy ourselves and our trip was amazing and we will definitely be returning to Greece using Hellenic Holidays!! Last month my wife and I took a two week vacation to Athens and three islands. I would be celebrating my 70th birthday and we were looking for a truly special experience. I spoke to friends and relatives who had traveled to Greece and inquired about their planning experience. Hellenic Holidays was mentioned frequently as the best and the leader for vacations to Greece. So my wife and I made an appointment to meet with Petros Zissimos, on a rainy Saturday morning in New York City. He really wanted to know what we were looking for in a vacation and wanted to know what we were interested in doing and also not interested in doing. We were totally impressed with his knowledge and caring about vacations to Greece and could arrange a vacation suitable for our needs and budget. Petros arranged a vacation streamlined for us. We had beautiful hotels in wonderful locations that exceeded our expectations and were within our budget. He gave us excellent recommendations as to where to dine and in some cases who to ask for at the restaurant. He gave us information as to suggested gratuities (info that was incredibly helpful) and how to reach him during the trip, if necessary. With his super-detailed itinerary and focus on detail we even knew in advance the exact time our luggage would be picked up at the hotel or the length of time to be transported to the ferry or airport. It made for a 100% wonderful vacation and one of the best trips we have ever taken. I would use Hellenic Holidays when we return to Greece again (which I hope is soon). They pride themselves in the quality of the service they provide and should be recognized for this. The only reason I’ve given Hellenic Holidays 5 stars, is because there isn’t an option to give them 10!!!! Petros and his company are simply the best if you are looking for a once in a lifetime trip to Greece. I had never been, but heard amazing things about so many of the islands, it was almost too much to try to sort through. I also knew that for a honeymoon, I wanted a unique, first class experience. Petros was patient, and thoughtful, and presented many options, in many different pricing packages. We ended up on an 11 day 9 night trip to Athens, where we saw the Acropolis, with all its sights. Petros arranged a private tour, not with an ordinary tour guide, but with a PhD in Archaeology. Basically Greek Indiana Jones showed us around and explained to us what we were looking at. We spent the rest of our time here exploring the Plaka and enjoying the sights of the city. All of Petros’ travel arrangements (airplane, ferries, and pickups to and from hotels) were first class (literally), and his restaurant recommendations were phenomenal, even for my wife (she’s a vegetarian). I don’t think I could have even come close to planning a trip as well as Petros, and if you are thinking about going to Greece for your honeymoon, you have to give Petros a call. We can’t say enough about the hard work Petros put into our perfect honeymoon! We were very fortunate to come across his website – Petros was incredibly responsive and we connected over his passion for Greece and envisioning a top-tier experience for us given our varied interests. He suggested Athens, Náxos and Santorini to capture history, nature and leisure all in one trip – after booking with him, every other major concern was taken care of seamlessly. In a busy year for us, I can’t say enough about what a relief it was to “unload” one big ticket item onto a trusted partner, and have it managed without fuss or issue. Prior to our trip, we received a detailed itinerary that told us where to go and what to expect from each transfer, tour and experience we booked; also within were recommendations for attractions, walks, and high-quality dining (we followed through on several of these, and were not disappointed!) Petros alerted us early to an air controller strike that would delay our flight, allowing us to reschedule transfer to our departing airport; on his end, his team was ready and waiting for our late flight when we reached Athens. In similar fashion, every experience we booked through Petros or at his recommendation was smooth, allowing us to really enjoy our time in each locale. The focus of our honeymoon was truly in spending time with each other and appreciating Greece! – we enthusiastically recommend HH and Petros to others wanting a great honeymoon! Petros made our trip a joy! 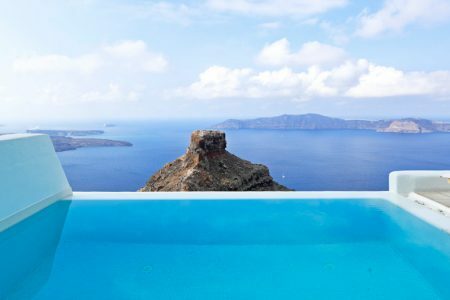 The Electra Hotel in Athens, the Naxian Collection on Naxos and the Vedema on Santorini were outstanding properties. The staff and drivers at each location were most helpful and informative. Petros kept up with us throughout our visit and informed us of a one day transportation strike, resulting in a glorious extra day on Naxos. I highly recommend Hellenic Holidays to plan your trip. A+++; top drawer all the way!! Thank you, Petros! We used Hellenic Holidays for our honeymoon and the trip was absolutely fantastic. Starting with the logistics of the trip, everything was taken care of and went smoothly. It was so reassuring to simply arrive in the airport and know we has a transfer waiting at each destination. On top of that, every person Petros set us up with were knowledge, accommodating and most importantly friendly! There is not one thing I would’ve have changed about the trip, and I would like to add how great Petros’s recommendations were. From the restaurants to the tours, everything he suggested was prefect. In fact, one restaurant he sent us to in Naxos was so delicious, we recommended it to others at the hotel we stayed at, and everyone came back raving about it. I highly recommend not only going to Greece, but using Hellenic Holidays for your honeymoon. Trust in Petros, he will not disappoint. My husband and I used Hellenic Holidays for our honeymoon to Greece (Athens, Crete, and Santorini) and could not be happier with that decision. He was recommended to us by a friend. Petros was great to work with and we could tell immediately that his expertise was second to none. Everything from the hotel accommodations, transportation, excursions and restaurant recommendations were great. He took into account what our interests were and recommended only what we would enjoy. With everything else we had going on to plan the wedding it was great to know that Petros was taking care of all the logistics for our honeymoon. He made our honeymoon an experience to look forward to, not something to stress about. He gave us a detailed itinerary and options for activities. We felt truly taken care of so that when we got to Greece, we could just relax. All of the excursions that he planned for us went off without a hitch and we enjoyed every bit of it. We would highly recommend planning your honeymoon through Petros. My family of 6 just got back from a fantastic trip to Athens, Rhodes, and Crete. 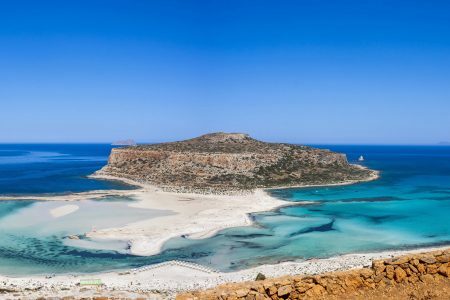 My daughter worked with Petros a couple of years ago to plan her honeymoon, and when we started talking about planning a family trip, we knew Hellenic Holidays would do another incredible job. And they did! We traveled from the end of April to the beginning of May with our children and their partners. The travel itself was a breeze – Petros arranged our in-Greece transportation to/from the airports and to/from the islands. The drivers were punctual, friendly, and shared interesting facts about their cities. And the planning process was so fun! We did a couple of three-way calls with Petros to talk about what we wanted to get out of the trip. Petros gave us hands-on attention, and based on his extensive personal knowledge of the different destinations, he crafted the perfect trip for us.